Surrealism inspired world map showing Air France routes. Air France Reseau Aerien Mondial. 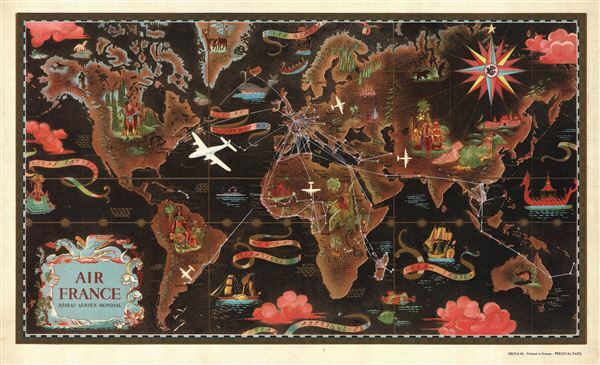 A remarkable 1947 original Lucien Boucher comic map of the world showing the routes of Air France. Boucher started producing maps for Air France as early as 1933. Most are inspired by the surrealist ethic and feature numerous vignettes. The present example illustrates the American with stylized indigenous American Indians, Australia with ostriches and Asia with exotic Garuda barges, tigers, and temples. The publisher has utilized chromolithographic printing techniques to achieve splendid rich tones throughout. This map was printed for Air France by Perceval of Paris. There is an id number in the lower right quadrant: 208/P/6-48. Lucien Boucher (1889 - 1971) was French cartoonist, artist, writer, and illustrator. Boucher was born in Chartres in 1889 and graduated from the École de Céramique de Sèvres. His work as a cartoonist appeared in the humorous weekly Le Rire. Starting in the 1920s he produced numerous pictorial posters inspired by the commercial promise of surrealism. Among them were a series of surrealistic planispheric and celestial maps drawn to illustrate the transportation networks of Air France. Very good. Minor soiling to outer margins. Minor tear extending 1/2 from left edge into margin, does not affect printed image.